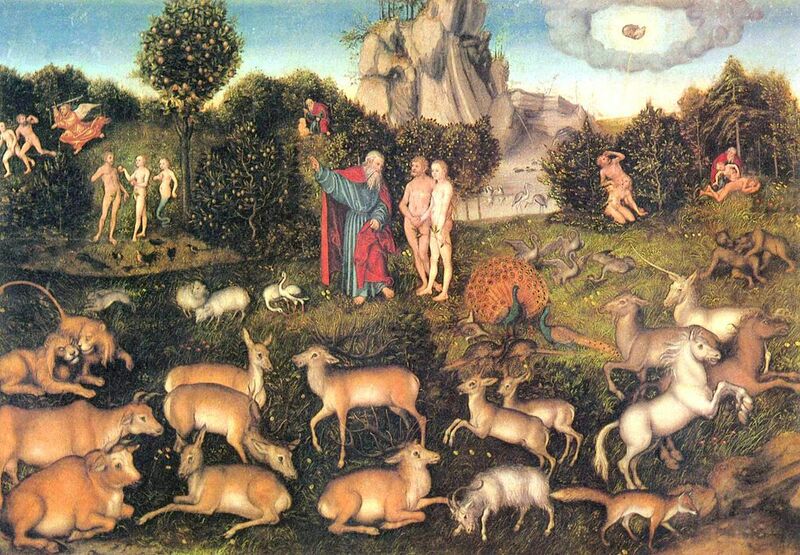 “The Garden of Eden” by Lucas Cranach der Ältere, a 16th-century German depiction of Eden. Grandfather refers to a person as a mortal, a mover, a coverer, a reflection, an appearance, or a descendant. A coverer is the defender of a cover, a body, and for those with a body the breath is a certainty. Brahma promises to bring the breath to every living being without exception and by maintaining to and from people have the freedom to do just about whatever in this vast playground, albeit with consequences. The breath comes to saint and sinner alike and to accommodate everyone, the earth can be likened to the Garden of Eden, Hell, or whatever, the difference being a result of how the breath is utilized. The amount of time spent in selfless giving to others makes all the difference in the world. This world with all of its diversity is meant to be enjoyed, unfortunately, being mortal brings suffering. Our future situation is dependent upon our actions now, just as our current situation is a result of past actions. The verses say we will be here upon the earth, repeatedly, life after life, if we do not follow the Holy Teaching. To follow the teaching of the Rigveda, the Sacred Text of the Sacred Knowledge, to become awakened for being a guide to heaven for others so that all can experience the highest state. A Buddha, a Magian, a Messiah, or an Aditya are titles for those who have gone beyond to be with the Eternal Spirit Pervading the Universe, but return to live as an example of the doctrine. In short, the Enlightened One has abandoned the mortal condition to live for a mortal. A mortal attains the Heavenly State through service to heaven, and service to heaven is serving upon the earth for the benefit of all beings. Here is a verse from the Veda for enjoying the day in paradise. The Lord and Master wander in the early morning in paradise bestowing the knowledge and water with the light, to be powerful to make fast for fulfillment for the anxious to come after the precious to have in one’s power, to wander to for this measure of That to grow in the heart for those.